On the main stage Textures opened Symforce. And I could think of no better band to open this festival, air tight and energy packed this young band really set the tone for the rest of the festival. Being a good illustration of what this years Symforce had in store, Textures played ProgMetal without compromise. Making very very clear that the main stage would be a Metal domain for the rest of the day. And it must be great to open such a festival in your own backyard (Textures is a band from Tilburg). The enthusiasm and fun that Textures have in their play really shows and it did not take long before they had the audience under their spell. And of course it did help that a large number of die hard Textures fans were present. Textures have made an art form of creating music out of an unpredictable and complex flow and a wall of sound mixed with melodic moments. And it's exactly that quality that makes them the perfect opener for this years Symforce. 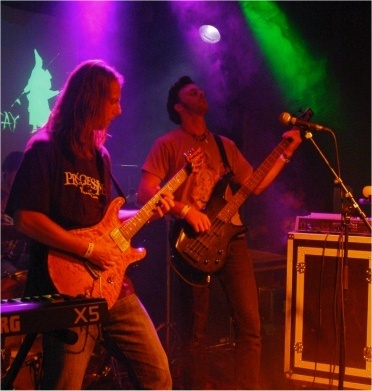 While certainly a metal band, they were one of the loudest bands on Symforce, Textures showed the true meaning of progressive. But they have chosen the correct name, especially live it is very clear that they lay a blanket of sound creating a Texture of music. And a nice texture I might add, generally people were really impressed by this band and they certainly set a standard hard to top by other bands during the rest of the festival. For the very first time Magic Pie from Norway played in The Netherlands and they were obviously excited about it and hoped to come back soon! And considering the positive responses to their concert it's not unlikely that they will be soon. 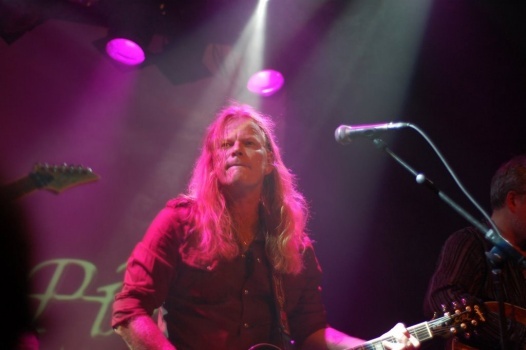 With their brand new singer Eirikur Hauksson, who looks a bit like he just stepped out off a heavy rock group which is not surprising knowing he's also a member of Ken Hensley's Live-Fire, they showed themselves from their best side. In their home country they were proclaimed as 'Group of the year 2007' which is an impressive acknowledgment for a progressive rock group. Their performance on Symforce II showed how they earned that title. With 6 men on stage they laid down a solid show, mainly playing songs from their most recent album Circus Of Life. Only the title song and Change as the encore were played from their debut album Motions Of Desire. After coming to the stage to the sound of a short mix of Full Moon Poetry they kicked off with the title song of their first album and the tone was quickly set convincing the audience they had chosen the right room. Just a pity the drums came over a bit too prominently; which is actually the only minor point I can think of to mention. The rich and full sound Magic Pie accomplishes on the album was well reproduced here live and especially the excellent vocal harmonies on which almost the whole band joined in were an enjoyment to hear and reminded of earlier Spock's Beard in that respect. With 2 electric guitars, 1 acoustic guitar, 1 bass, 1 drums and 1 keyboard they produced a very good sound of sturdy progrock with some symphonic elements. With their choice of longer songs, the lack of fear to improvise or at least alternate to the studio version now and then and certainly their enjoyment of playing here made this show to an absolute highlight of this day. Playing a 20 minute long song (Change) as the encore is perhaps the best proof this band is one to reckon with and a tip to visit when they're in your neighbourhood! On my way from Magic Pie to Demians I wanted to have a quick peek at Quantum Fantay. 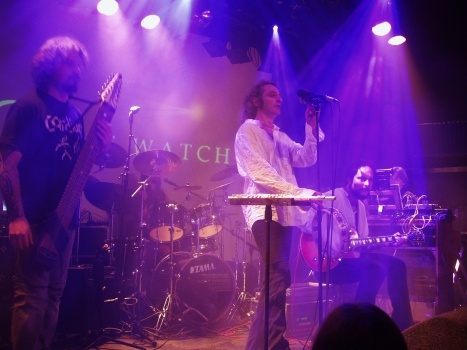 This Belgian band plays space-prog related to Ozric Tentacles with influences by Marillion and Supertramp. A foundation is made by drums, guitar and bass and the atmospheres are created by keyboard and surprisingly by a flute. The last instrument really surprised me in a positive way, it created a very dreamy feeling. I have no idea which songs they played, sometimes they even did not know the titles themselves, but this band surprised me. It's hard to keep things exciting with spacey sounding music and all depends on the right atmosphere. Quantum Fantay succeeded in creating just that, the Batcave was the perfect place for this kind of music. I stayed a bit longer than I expected but like every festival I had to leave earlier than I wanted. Hopefully next time I can enjoy a full show, big thumbs up for Quantum Fantay. If your first time playing abroad is the mainstage at Symforce, then you must be doing something right. From out of nowhere Demians became a well known name in the progressive rock scene and the popularity of their debut-album, Building An Empire, surprised everybody. 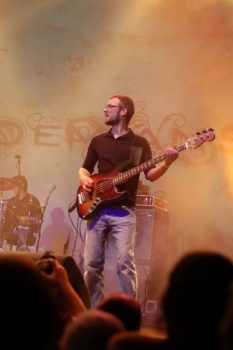 Altough Demians appeared as a band at Symforce, they are in fact the brainchild of Nicholas Chapel and this shy guy from France wrote and recorded the debut album all by himself. 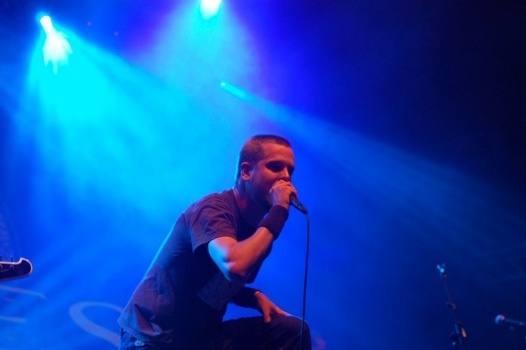 For this tour he is accompanied by drummer Micha�l Roponus and bassist Antoine Pohu. The keyboard player suddenly got cold feet and decided to leave the band just a few weeks before Symforce. Which not only meant that the big stage would appear a bit empty but also that all the keyboard parts had to played by a sequencer. They started of very nervously and were constantly tuning and changing things. Saphire and Naive sounded a bit flat and a lot of curious people who did not know Demians left to see some of the other bands. Temple featured lots of keyboard sounds so it was just a tape with Nicholas singing over it. When he did not play his guitar he could focus more on his vocals and he sounded a lot better. From that point on the sound was better and Earth was more up to par than the first songs. Feel Alive was a new song and then it struck me that you really needed to know the music before to enjoy his performance. If this show was your first contact with the music of Demians you might not like it. The last song Sand was a very personal one. A very long song with very mellow parts, the audience was clearly having trouble maitaining their attention. Afterwards Nicholas Chapel explained to me that he was a bit sick and the band was very nervous. Considering the fact that they do not have any personal helping them with their equipment and a keyboard player who bailed out with stage fright, this was probably the best under these circumstances. Maybe they would have been better of in the small venue, it would certainly have suited the music of Demians. We will certainly hear more from this band and let's see how much this young band will learn and grow in the meanwhile. Being an avid Genesis fan, especially the early years (naturally), The Watch from Italy can't do much wrong with me. Often called the Italian alternative to Genesis their music is made totally in the vein of the classic Genesis, but still they manage to develop a parallel style of their own with their own songs. Just as with their big example the sound of The Watch is based around a mellow carpet of lush keyboard and guitar sounds. Well hidden behind a big ancient mellotron and other keys Fabio Mancini is just as unobtrusively, but indispensable as Tony Banks is in Genesis. To make matters even more confusing The Watch also has a Mr. Gabriel within its ranks, but he's called Giorgio Gabriel and plays guitar and was seated in a very Hackett-way during the whole concert. Cristiano Roversi has absolutely no resemblance with Mike Rutherford, but he obviously shares Mike's passion for different kind of guitar-like instruments with lots of strings since he eloquently played a Chapman grand stick among others. Marco Fabbri on drums was not so obviously present as Phil Collins can be, but hidden behind the drum kit laid down a solid rhythm just like Chester Thompson. Finally Simone Rosetti luckily does not try to copy Peter Gabriel on vocals, but he does play some tunes on a flute too. Not quite reaching the vocal abilities and creativity of Peter, Simone still stands firmly as the lead singer and brings over his contributions with true passion. This also shows when he even introduces a song in a theatrical and poetic way with a short story IN DUTCH (read from a paper), clearly a language not easy for an Italian tongue! So all in all this motivated lot of musicians brought on stage a very driven set which I fully enjoyed, so much I even forgot to make some notes on the way. But what could have I written anyway, apart from the that fact I witnessed an excellent show, even though the quality difference between Genesis and The Watch always is unavoidable clear. But when The Watch threw in a Genesis classic in the form of The Fountain Of Salmacis the general feeling in the audience was that Genesis could not have played it that much better. Their own compositions perhaps lack that extra touch of genius, but they are definitely very apt for their style, composed in the old Genesis vine and are often longer multi-layered tracks; for all certainly better than the later poppy Genesis songs. The whole set was a celebration of the early Genesis sound and again proved its intensity and creativity in a terrific way. My first Pain Of Salvation show, during their Remedy Lane tour, is one I still have very fond memories of. But my last encounter with Pain Of Salvation was not that satisfying. After standing around waiting because of technical problems for a very long time (over an hour!) the band finally came on stage and the sound was still terrible. I came to this show with the feeling that they finally had the chance to make up for that experience. To put it short: they did! What a great show. A setlist with a good mix of old and new song, heavy and soft. And a band well prepared for a good show. But the main attraction must have been Daniel Gildenlow: the frontman was in a playful mood and really enjoyed fooling around with the audience. By starting off with the emotional song Falling POS grabbed the audience's attention immediately. As this song is the intro to The Perfect Element that was the most logical song to continue with. 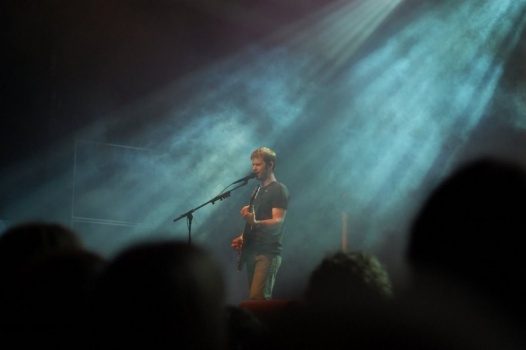 Then it looked as if less people in the audience knew the next song Revival, off the album Entropia. But America certainly was a better know song. But all that seemed to be no more then a warm-up for the last part of the show, because starting with Undertow the band really lifted off. From the very strong Ashes to the angry Scarsick, the haunting Nightmist and the firm Diffidentia it all seemed to be over way to fast. The band came back for an encore and played Disco Queen in a way very familiar to POS: tongue in cheek serious (so not serious at all). Of course this song is perfect for that. And when the last notes died out the familiar feeling of a good concert came upon me: it should have lasted longer, they should have played this one song they should have done another encore. But truth is, if a concert is this enjoyable the seem feeling would have struck me after the 10th encore... 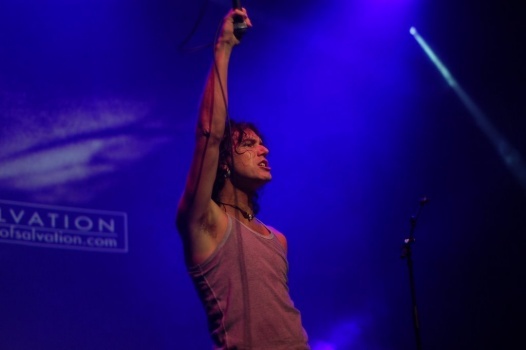 Pain Of Salvation showed why they are one of the top prog metal bands! Great performance.